1813 ~ 1824: born in Edo. Second son of Tachibanaya Jisuke, an accounting manager at the Ichimuraza. He becomes a disciple of the star Bandô Mitsugorô III, who decides to adopt him and gives him the name of Bandô Tamanosuke I. 11th lunar month of 1824: he appears on stage for the first time, taking the name of Bandô Tamasaburô I at the Ichimuraza. 6th lunar month of 1827: premiere at the Kawarasakiza of Tsuruya Nanboku IV's drama "Hitori Tabi Gojûsan Tsugi"; Tamasaburô plays the roles of the courtesan Iroha and Shinanoya Ohan [casting]. 8th lunar month of 1829: tour in Nagoya with Bandô Hikosaburô IV. Tamasaburô achieves a great success by playing the roles of Okon and Yûgiri in the dramas "Ise Ondo Koi no Netaba" and "Kuruwa Bunshô" in the precinct of the Seijuin Temple. 1st lunar month of 1830: Tamasaburô and Bandô Hikosaburô IV settle in Ôsaka. They perform together at the Naka no Shibai. Tamasaburô plays with success the role of Ohan in the drama "Katsuragawa Renri no Shigarami" (commonly called "Obiya"), which is produced by the zamoto Fujikawa Katsusaburô. 27th day of the 12th lunar month of 1831: his adoptive father Bandô Mitsugorô III dies. 11th lunar month of 1832: Tamasaburô goes back to Edo, playing the roles of Hanazono and Kosakura in the drama "Bandô Musha Tsunagate Hajime", which is staged at the Ichimuraza. 11th lunar month of 1839: Bandô Tamasaburô I takes the name of Bandô Shûka I at the Ichimuraza, playing in the drama "Taiheiki Irifune Shinozuka". Shûka is in fact a haimyô which was used by Bandô Mitsugorô III. 6th lunar month of 1841: tour in Kôfu; Shûka plays at the Kameyaza the roles of Kaoyo Gozen, Okaru and Tonase in the classic "Kanadehon Chûshingura". 1st lunar month of 1843: premiere at the Ichimuraza of the dance "Kashiragaki Ise Monogatari" (commonly called "Noriaibune"), which is staged within the new year drama "Kioi Uta Soga no Hanadashi"; Shûka is one of the seven dancers [more details]. 6th lunar month of 1845: Shûka plays at the Ichimuraza the role of Yaegiri in the drama "Komochi Yamanba". The role of Sakata Kurando Tokiyuki is played by Mimasu Baisha. 8th lunar month of 1845: Shûka plays at the Ichimuraza the roles of Osato ("Sushiya") and Shizuka Gozen in the classic "Yoshitsune Senbon Zakura". 1st lunar month of 1846: premiere at the Nakamuraza of Sakurada Jisuke III's Tokiwazu-based dance-drama "Kagura Uta Kumoi no Kyokumari", which is commonly called "Dontsuku"; Shûka dances in it [more details]. 8th lunar month of 1848: premiere at the Ichimuraza of Nishizawa Ippô's drama "Eiri Shôsetsu Asagao Monogatari"; Shûka plays the role of Miyuki [casting]. 9th lunar month of 1850: premiere at the Nakamuraza of the drama "Minoriyoshi Kogane no Kikuzuki"; Shûka plays the role of Hatsushiba [more details]. 2nd lunar month of 1851: premiere at the Ichimuraza of Sakurada Jisuke III's Kiyomoto-based dance "Akegarasu Hana no Nureginu", commonly called "Urazato Tokijirô"; Shûka plays the role of Yamanaya Urazato [casting]. 5th lunar month of 1851: Shûka plays at the Ichimuraza the role of Princess Taema in the drama "Narukami". The role of the wicked priest Narukami is played by Ichikawa Danjûrô VIII. 11th lunar month of 1851: Shûka plays at the Ichimuraza the role of Osono in the drama "Hana Momiji Kôra no Furugaki" (similar to the play "Hikosan Gongen Chikai no Sukedachi"). The role of Rokusuke is played by Sawamura Chôjûrô V.
1st lunar month of 1852: premiere at the Ichimuraza of Sakurada Jisuke III's drama "Satomi Hakkenden"; Shûka plays the roles of Inuzuka Shino and Princess Fuse [casting]. 3rd lunar month of 1852: Shûka plays at the Ichimuraza the role of the shirabyôshi in the dance "Kyôganoko Musume Dôjôji". 9th lunar month of 1852: the play "Sesshû Gappô-ga-Tsuji" is staged for the first time in Edo, at the Ichimuraza; Shûka plays the role of Tamate Gozen [casting]. 4th lunar month of 1853: Shûka plays at the Kawarasakiza the role of Shizuka Gozen in the "Yoshinoyama" and "Shi-no-Kiri" scenes of the classic "Yoshitsune Senbon Zakura"; the roles of Tadanobu and Yoshitsune are played by Arashi Rikaku II and Bandô Takesaburô I. 5th lunar month of 1853: Shûka plays at the Kawarasakiza the role of the female thief Hanaoka, who holds 5 different names and disguises (Kaminari no Onaru, Gokuin Osen, Hotei no Oichi, Annozaka no Odaka and Karigane no Obun), in the drama "Karigane Gonin Onna". This parodic play is in fact the female version of the famous "Karigane Gonin Otoko", an Ôsaka sewamono whose heroes are 5 thieves called Kaminari Shôkurô, Gokuin Sen'emon, Hotei Ichiemon, An no Heibei and Karigane Bunshichi. 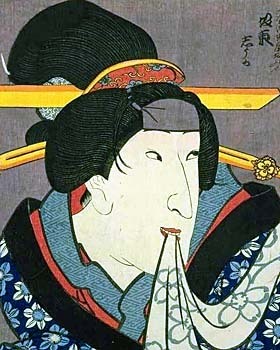 3rd lunar month of 1854: premiere at the Kawarasakiza of Kawatake Shinshichi II's drama "Miyakodori Nagare no Shiranami"; Shûka plays the role of the keisei Hanako, in reality the thief Tengû Kozô Kiritarô, in reality Yoshida Matsuwakamaru [casting]. 6th lunar month of 1854: premiere at the Kawarasakiza of Shinoda Sasuke's drama "Kumo no Uwasa Onna Narukami"; Shûka plays the role of the ama Narukami [casting]. 11th lunar month of 1854: Shûka appears on stage for the last time, at the Kawarasakiza, playing the roles of Kaoyo Gozen and Okaru in the classic "Kanadehon Chûshingura". 6th day of the 3rd lunar month of 1855: Shûka dies in Edo. Bandô Shûka I was an outstanding onnagata, who developped excellent diction and personal acting techniques. His forte were courageous and wild-spirited female roles. His fame in Edo between 1840 and 1854 was as high as his tachiyaku stage partner Ichikawa Danjûrô VIII. Bandô Shûka I's best roles: Okaru ("Kanadehon Chûshingura"), Yae ("Sugawara Denju Tenarai Kagami"), Agemaki ("Sukeroku"), Shizuka Gozen ("Yoshitsune Senbon Zakura"), the ama Narukami ("Onna Narukami") and Ohan ("Katsuragawa Renri no Shigarami"). Bandô Shûka I received posthumously the name of Bandô Mitsugorô V and his son, who was Bandô Mitsugorô V, became Bandô Mitsugorô VI.